Are you suddenly craving certain foods at odd moments and want to know why? If you're craving shrimp, it could simply be because you love this nutritious food. Or, your craving might be a sign of something else. Therefore, knowing more about shrimp cravings is a must. If your body lacks sufficient protein, you might find yourself craving shrimp or other protein-rich foods -- like poultry, meat, eggs, or cottage cheese. Shrimp provides you with just over 20 grams of protein (and about 85 calories) in each 3-ounce portion, which gets you well on your way to meeting daily protein requirements. The protein recommended dietary allowance (RDA) is 71 grams daily for pregnant and nursing women, 56 grams for men, and 46 grams per day for non-pregnant women. Athletes need about 0.5 to 0.9 grams of protein for each pound of body weight daily, notes the American Academy of Nutrition and Dietetics. One theory, although not proven, is that you'll crave foods containing nutrients your body is deficient in. Sugary foods are an exception, as sugar provides calories but few essential nutrients. In addition to being protein-rich, shrimp is a good source of iodine and selenium, so being deficient in these micronutrients could theoretically cause shrimp cravings. However, more research is needed in this realm. One reason you're craving shrimp could simply be you're hungry, and shrimp is within eyesight (or smelling range) of you. The saying "don't grocery shop when you're hungry" has some truth to it. Almost anything looks appealing when your body needs calories. 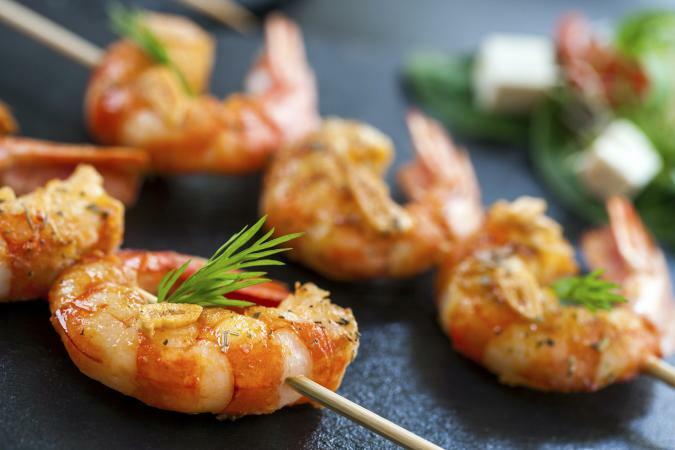 Fortunately, shrimp is a healthy food to devour when hunger strikes as long as it's cooked in a healthy manner like broiling, baking, or grilling. While reasons cravings occur during pregnancy are up for debate, pregnancy cravings are common occurrences. The type of food craved during pregnancy varies from person to person, so it's possible shrimp could fit the bill for you. Fortunately, shrimp is low in mercury -- so it's safe to eat up to 12 ounces per week while pregnant or breastfeeding, notes the American Pregnancy Association. Just because you're craving shrimp doesn't mean you're deficient in nutrients or are pregnant. You might be craving shrimp simply because you love the taste of this delicious, nutritious treat. If this is the case, you're lucky because many commonly craved foods include sugary sweets that can pack on unwanted pounds. Adding shrimp to your diet is as easy as choosing a shrimp recipe for dinner or steaming or grilling shrimp any time you're craving it. If you're not a fan of shrimp but want the essential nutrients shrimp provides, try fish, eggs, or dairy foods. Like shrimp, these alternatives are also rich in protein, iodine, and selenium.